As Wayne Rooney and the England squad prepare for their first World Cup match in South Africa, leading public services provider Amey has launched a football championship and a quiz to help promote national Men’s Health Week. Amey, which has 11,000 staff, has already launched a WellBeing programme which raises awareness of the benefits of making healthier lifestyle choices. This includes offering health promotions and awareness campaigns, activity programmes and even weigh-in clubs using its very own Amey 8-week Healthy Eating Plan, developed by nutritionists. Now Amey has become an official sponsor of the Men’s Health Forum, an independent, authoritative voice for male health - and has launched an on-line health quiz to promote Men’s Health Week. The company is also launching a football championship. “We believe that if our people are physically and emotionally resilient, they are more likely to enjoy working for us. This creates a happier working environment, and means they are more able to cope with the ever-changing demands of a large company such as Amey, which helps to deliver better results,” says Mark Bradshaw, Amey’s head of Reward and Policy. “For this reason, Amey has rolled out a comprehensive health and WellBeing programme to help staff achieve their full potential. Amey’s football championship is part of the Health Olympics - a series of events taking place over the Summer months, each one promoting a different health theme across the business. Teams from Plymouth to Perthshire will take part in an FA Cup style contest to win trophies and runner-up medals. 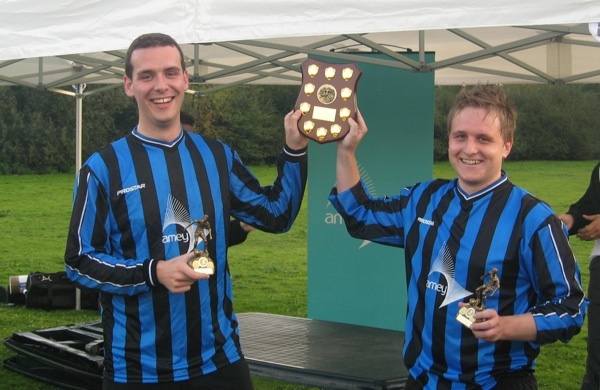 From L-R – John Jordan, Amey graduate engineer and Aaron Murray, Amey senior planner, celebrate victory in a previous Amey football championship. Amey - amey.co.uk - is a leading UK public services provider with more than 11,000 staff. The company works across three main markets - Inter Urban, Local Government and Built Environment, which are supported by our award-winning consultancy division. National Men's Health Week (14-20 June 2010) is organised by the Men's Health Forum and will encourage men and boys to be more physically active. As part of National Men's Health Week 2010, a campaign will be launched to get a million more middle-aged (35 to 64 years) men exercising.